Illinois Coalition for Immigrant and Refugee Rights (ICIRR), Immigrant Defense Project (IDP), National Day Laborer Organizing Network (NDLON), Northern Manhattan Coalition for Immigrant Rights (NMCIR) ICE’S MINOR ADJUSTMENTS TO “SECURE COMMUNITIES”: WHY THEY FALL FAR SHORT On June 17, 2011, Immigration and Customs Enforcement (ICE) announced a set of adjustments to its controversial “Secure Communities” program (S-Comm). This program puts local police on the frontlines of immigration enforcement to assist ICE to meet the Obama Administration’s quota of deporting 400,000 immigrants each year. 1. ICE’s adjustments come in response to growing opposition from states and localities, but fail to address their desire to not participate and the fundamental problems associated with SComm—including how collaborations between police and ICE funnel people into an unjust detention and deportation system. 2. ICE did not set any restrictions on who they could deport—ICE has always had the power to exercise prosecutorial discretion but has rarely done so. 3. S-Comm still undermines community policing, and the adjustments do not address the burden that the program places on already-stretched police departments. 4. ICE did not explicitly accept the decisions of counties across the country and three states who have refused to participate because of the serious problems with the program. Nor did ICE explain whether jurisdictions that were previously activated into the program can exit. Prosecutorial Discretion Memos*: The main “reforms” are new memos from ICE Director John Morton: One purports to guide ICE personnel regarding whom they should prosecute; the other purports to address the reluctance of immigrant crime victims and witnesses to cooperate with police investigations out of fear of deportation. Both memos largely restate existing ICE policy on prosecutorial discretion. The “Exercising Prosecutorial Discretion” memo does not prevent ICE from using S-Comm to deport any individual who is subject to deportation, including undocumented immigrants, permanent residents, and visa holders. For over a year, Director Morton has been instructing ICE to focus on serious offenders— yet S-Comm has continued to operate as a deportation dragnet. ICE statistics show most of the people arrested and deported through S-Comm have minor or no convictions. The “Certain Victims” memo states that ICE will offer special treatment for crime victims and witnesses. Yet ICE fails to acknowledge the complex dynamics of domestic violence and human trafficking, and all too often police do not recognize arrestees as victims. For example, police often arrest both parties to a domestic dispute and sort out the true perpetrator later. Because of S-Comm, “later” is too late: their fingerprints will already be sent to ICE. This memo provides no process for making sure ICE knows whether someone is a crime victim or witness or for informing such persons that being a victim or witness will make a difference. Too often people are pressured into signing away their rights to an immigration hearing and never have the chance to point out that they are victims or witnesses. Advisory Committee: ICE is creating an Advisory Committee to monitor S-Comm and make recommendations on how to “mitigate potential impacts on community policing practices.” It will purportedly work on limiting deportations of people who charged with but not convicted of “minor traffic offenses. The Committee is tasked with producing a report within 45 days. ICE is essentially hand-picking individuals who will be monitoring and proposing fixes while duplicating—and possibly undercutting—the Inspector General’s upcoming investigation of S-Comm. That ICE now claims it will review deportations of “traffic offenders” for a program purportedly focused on public safety shows that S-Comm functions primarily as a mass deportation program bent on meeting record-breaking quotas. Training Videos: ICE announced it will produce training videos and briefings for local law enforcement agencies on subjects like outreach to immigrant communities and immigration laws that offer protections to victims (see video at http://www.ice.gov/secure_communities/crcl.htm). These trainings and videos do nothing to address the burdens that S-Comm places on already-stretched police departments. A one-size-fits-all video and training produced by a federal agency cannot effectively instruct local departments on preserving community trust and conducting effective community policing. It is highly problematic that the video purports to tell police not to racially profile based on race or nationality, while at the same time repeatedly showing images of Latinos as “illegal” and non-Latinos as law enforcement. Complaint Process: ICE has tasked the DHS Office of Civil Rights and Civil Liberties (CRCL) with responding to complaints about S-Comm from individuals, community organization, and media reports. CRCL will also conduct quarterly statistical reviews to detect patterns of racial profiling. CRCL is an arm of DHS and is not an independent watchdog agency with teeth. CRCL has discussed neither how it will make individuals aware of the complaint process nor what resources it has to handle these complaints. Nor has it stated whether it can keep immigrants who have filed complaints from being deported while investigations are pending. Detainer Form: ICE revised the “detainer” form, an ICE request to local law enforcement agencies to hold an individual beyond when she would otherwise be released so that ICE can take custody. 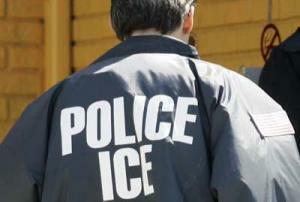 ICE also stated that it will set up a system for informing individuals if they have a detainer issued on them. ICE still fails to make clear that detainers are hold requests that local law enforcement do not have to submit to. ICE also fails to address a range of other problems associated with detainers, including their constitutionality. ICE continues to violate due process rights by not informing people why they are being jailed and by causing differential treatment in the criminal justice system (for example, detainees with immigration holds are routinely denied bail and jailed longer). This entry was posted in Documents and Reports, Featured, Organizing Resources on June 23, 2011 by Ian. “New York joins a growing chorus of state opposition to an ill-conceived, dangerous, and dishonestly-executed program. The more local law enforcement and elected officials learn about SCOMM, the more they have have opposed it. “It makes sense that New York is heading in the opposite direction of Arizona. Unlike Arizona, New York’s elected officials are proud of the state’s immigrant heritage, and there is zero tolerance for programs that imperil the civil rights of communities of color. “SCOMM not only diminishes community safety, erodes civil rights, and undermines our shared goal of advancing meaningful federal immigration reform- questions are now being raised about Department of Homeland Security’s legal authority to commandeer state resources in an unwise effort to ramp up its deportation numbers. Secure Communities (S-Comm) was originally sold to Congress and state officials as a program to identify and deport individuals who had been convicted of serious, violent crimes. This relatively uncontroversial proposition at first received little attention. But it quickly became clear that S-Comm was not what ICE represented it to be. Through FOIA litigation, ICE was forced to admit that about 30% of those deported through S-Comm have absolutely no criminal convictions. Another 30% have only minor misdemeanor offenses. See the latest statistics at http://www.ice.gov/doclib/foia/sc-stats/nationwide_interoperability_stats-fy2011-feb28.pdf. 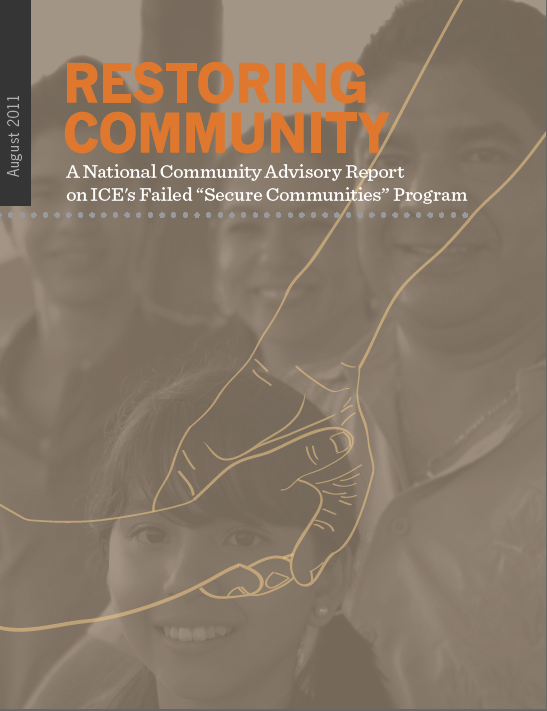 States and localities that had agreed to participate in S-Comm based on ICE’s representations of the program have rebelled upon discovering its broad sweep, based on concerns about the effect S-Comm could have on community policing, civil rights, resource diversion, and other concerns. See Illinois Gov Quinn letter terminating state participation; congresspeople letter to NYS. (available upon request). The Congressional Hispanic Caucus has called for a moratorium on the program, expressing concern that ”Secure Communities” is actually making immigrant communities and communities of color less secure. See http://uncoverthetruth.org/congressional-hispanic-caucus-calls-for-moratorium-on-s-comm. And ICE’s behavior in unrolling S-Comm is now the subject of an OIG investigation. As documented in a letter from Congresswoman Lofgren, the agency’s communications about S-Comm to Congressmembers and state and local officials were filled with lies and misrepresentations. See http://crocodoc.com/yrSVM1. This entry was posted in Organizing Resources, Press (New York), Press Releases on June 1, 2011 by Ian. 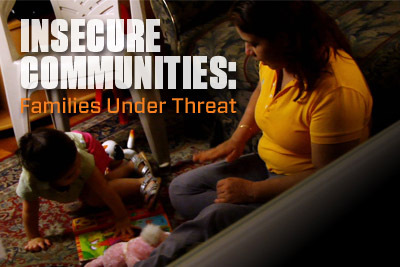 PETITION: Keep Montgomery County Safe from So-Called “Secure Communities” Program! A human rights crisis is looming in Montgomery County, MD. Imagine calling the cops because your boyfriend is beating you, and then being ordered deported from the country you call home! This is exactly what happened to Maria Bolaños under the so-called “Secure Communities” program in Maryland. Now, as U.S. Immigration and Customs Enforcement (ICE) ramps up deportations — in tireless pursuit of its yearly quotas — it is seeking to activate its controversial program in our County. Supposedly meant to help local police “get dangerous convicted criminals off the streets and out of the country,” the “Secure Communities” program has been largely sweeping up immigrants who pose no threat to the community. The reality is that most people deported from Maryland under “Secure Communities” have never committed a crime. By targeting hard-working immigrants—like domestic violence victim Maria Bolaños—this program is needlessly destroying Maryland families and severing trust residents once had in their local police, who depend on community members to report crimes and nab real criminals. Right now, anti-immigrant groups are already mobilizing their members against the resolution. It’s time to fight back! Sign the petition and help us send the message to our local county officials that we FULLY SUPPORT THE RESOLUTION AGAINST THIS DISCREDITED ICE PROGRAM! This entry was posted in Media, Organizing Resources on April 28, 2011 by Ian.